This guy hit us hard at the 2019 SW Type Conference in Belton TX. He has a power packed pedigree that will make great production females with tremendous look and design. This guy is a total package, he is built from the ground up with big square feet and flat bone. He is big legged with great width. He is long necked, longer faced with a high tail set. All In is big ribbed with a bunch of top shape and a big square rump. He has an excellent hip and hind leg set, 7-7 underline and excellent joints. This guy comes at you wide and square. Great for making those competitive show barrows and gilts with extra look and design. 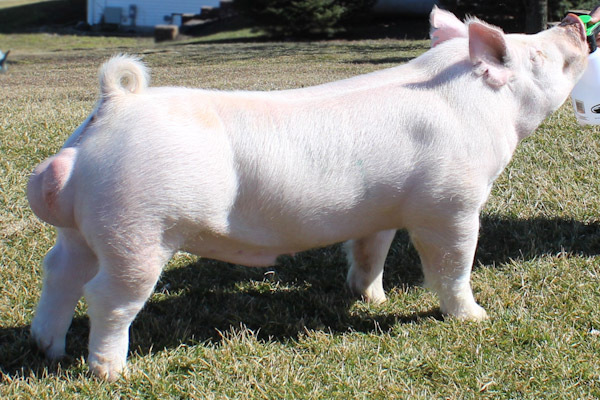 If you are trying to build a herd of sows that will lay down and flat raise pigs with that extra show pig look, All In will get that done.